Our experienced, head upland hunting guide Dave Trahan, owns On Point Kennel located in southern New Hampshire has lived in New Hampshire all his life. As a young man he would drive to Pittsburg NH to hunt. Dave has been training and breeding hunting dogs for over twenty years. He works dogs every day using the equipment On-Point Kennel sells. His kennel breeds Deutsch Kurzhaar-German Shorthaired Pointers that have completed the necessary tests required for breeding in the German regulation. All dogs are also tested in the NAVHDA test system. Together, they hunt in New England and the Mid-West United States. Working his dogs every day and hunting an average of 90 days each year gives Dave’s dogs plenty of wild game experience. When he is not guiding clients, he and his wife are working bird dogs and hunting together. Dave is the national president of the North American Versatile Hunting Dog Association (NAVHDA). His training techniques have been captured in video outlets and he has participated in training clinics in the US and Canada. 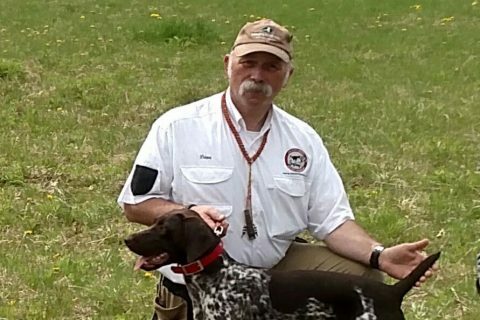 His expertise on dog training is evident here at Lopstick when his dogs hunt in the Great North Woods. Dave Trahan, a professional NH hunting guide, has worked together with the pro staff at Lopstick for several years. Dave along with other pro staff at Lopstick will provide you a hunt of a lifetime. Dave passion is for his dogs and he lives a life-style for which many hunters can only dream.